This application is for those wishing to apply for the Fair Ambassador position, successful applicants must be 18 years of age as of January of the year they are applying for. Please use this form if you wish to nominate someone you believe to have the skills to be an amazing Fair Ambassador. This application is for those wishing to apply for the Future Fair Ambassador positions, successful applicants must be 9-17 years of age as of January of the year they are applying for. Would you like the Fair Ambassador to appear at your event or meeting? Please fill out this form and email it to the address on the form. Our Ambassador would be honored to attend! Attention all Community Leaders, Business Owners, 4-H, FFA, Girl and Boy scout leaders! Do you know someone who would make a great Fair Ambassador? You can now nominate them to encourage their participation in promoting the fair! These nominations will be in addition to the regular applications. • Nominees must be at least 18 years of age by Jan 1 of year during serving year. • Nominees may be Male or Female. • Nomination Form must be accompanied by a letter of recommendation from Nominator. • Nominees MUST be a resident of the United States and the State of Wisconsin. Second Friday in November at the Crawford County Administration building at 5:30 p.m., unless noticed of a change. My parents are Jon and Becky Nagel I am a first-year student and Southwest Wisconsin Technical College in Fennimore, WI. My goal is to obtain my Associate Degree in Agribusiness Management. I graduated from Wauzeka-Steuben High School. I was the 2017 Crawford County Senior Fair Ambassador. I show pigs and sheep at the Crawford County Fair. I currently work at Achenbach Hy-View Dairy Farm located outside of Eastman. Each year, I look forward to attending the fair to go to the Derby, Truck and Tractor Pull, and most important, to spend time with all the people who attend the fair. As the Crawford County Fair Ambassador, I plan to teach others about the events that occur during the fair and all the family friendly events it offers. My parents are Jenni Achenbach and Keon Horton. I am 16 years old and attend Prairie Du Chien Highschool. I am involved in FFA, 4-H, State Fair Dairy Club and cheerleading. I am currently on the Dairy Judging Team for FFA and 4H, I have received a 1st place in Dairy Judging for FFA and 2nd place in 4H Animal Science Judging and then went to state. At the Crawford County Fair, I show sheep and dairy. I enjoy going to the fair because I enjoy the fair atmosphere such as the people, food and fair events. Brooke enjoys spending time with her horse, playing the ukulele and of course being at the fair! Brooke shows beef and pigs at the fair, as well as quilts and baking. While at the fair, she enjoys spending time visiting with people, taking in all the entertainment and working in the 4-H foodstand. She is excited to work with the other Fair Ambassadors to promote the fair this year. 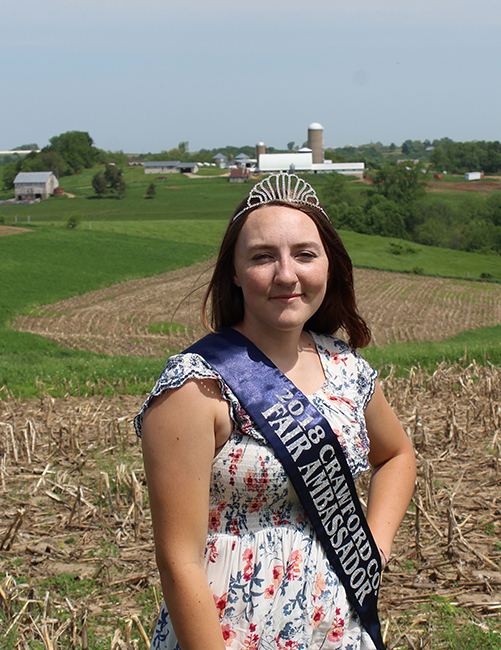 The 2018 Fair Ambassador is Cali Cauffman is the daughter of Mike and Laurie Cauffman of rural Viroqua. Cali is currently attending University of Wisconsin - Platteville. Cauffman has participated in the Crawford County Fair as an exhibitor and volunteer. Cali Cauffman sponsor is Brenda and Gerald Nagel's Farms. 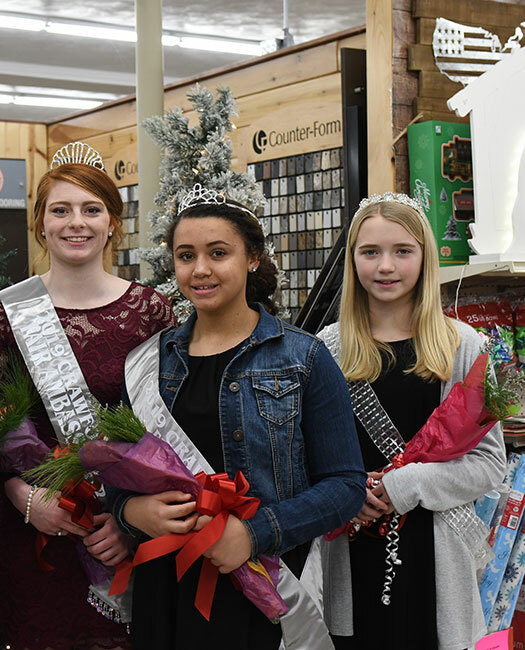 The 2018 Junior Future Fair Amabassador is Mikeala Cauffman is the daughter of Mike and Laurie Cauffman of rural Viroqua. Mikeala is proud to share her excitement of showing Swine at the fair along with other projects she completes. Mikeala also enjoys many sports and especially basketball. Cauffman sponsor is Brenda and Gerald Nagel's Farms. Do you want to be a Future Fair Ambassador? Apply today! The Future Fair Ambassador contest in split in two categories: Senior Future Fair Ambassador and Junior Future Fair Ambassador. Juniors are candidates age 9 – 13 and Seniors are candidates 14 – 17 as of January first of the year for which they are applying. All contestants will receive a small gift. Runners up in either category will receive the title of Future Fair Ambassador Attendant. (Senior or Junior) Attendants will assist the Future Fair Ambassador (Sr. and Jr.) with fun promotional activities throughout the year and at the fair. Candidates will be judged on their personality and knowledge of the fair industry and fair promotional activities. Who will be the Next Fair Ambassador??? The Crawford County Fair Ambassador is the official ambassador of The Crawford County Fair. In addition to serving as the official ambassador of The Crawford County Fair, The Crawford County Fair Ambassador represents and promotes the Fair at events throughout Crawford County and beyond, including area parades, festivals, and other community events. 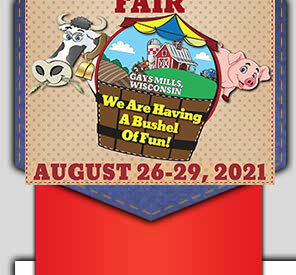 The Crawford County Fair Ambassador will also represent Crawford County at the Wisconsin Association of Fairs Convention and participate in the Wisconsin Fairest of the Fairs competition.